At 2.5lbs and 10 weeks old, we welcome our new (fur) baby, Indy! I’ve wanted to get a puppy since I moved out of my parents’ house. Having grown up with a family dog my whole life, I was so sad to leave behind my Shih Tzu and Yorkie. My parents wouldn’t let me take them with me! Finally, I came across a breeder and fell in love with Indy’s picture. I called up and two days later brought him home. My boyfriend named him, after Indiana Jones, naturally. I think he’s a great addition to our little family. He’s becoming well adjusted to his new home. In other news, I GOT THE JOB! I am now a full-time nanny to two year-old boy/girl twins. They’re absolutely adorable and I’m really excited about being their caregiver. I love children and I’m glad I get to do this for a living. I’ll be honest, I’m still a little bummed about not being able to find a teaching job, but I always say “everything happens for a reason,” and I can’t think different about this situation. I try to take everything that happens to me as a new adventure and learning experience. Hey!! I found your blog through 'Lives of Doctor's Wives!' The new puppy is SOO cute..what kind of dog!? Me and the boy CAN'T wait to get a puppy..but that probably won't be for at least another year! Good luck through this journey..my boy (his nickname is MIGM) is a MS4..so we're almost done! Congratulations on your new job and the new addition to your family – the little pup is SOOO cute! What breed is he? Thank you both! 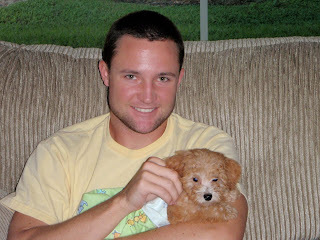 He's a toy poodle. The breeder said he may double his weight or only gain one more pound. I thought he was going to be bigger, oh well! Just found your blog. Your new puppy is sooo adorable!! Thanks Amber! Good luck to you and your man, long distance. I know I will have to do that someday. Congrats on the job and your puppy is quite precious!! Your puppy is adorable! 🙂 Congrats on your nanny job! I know you will find a teaching job soon! I just found your blog through another med school blog. 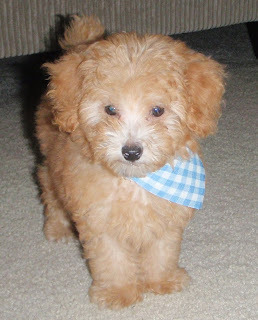 Indy is adorable…a toy poodle puppy joined our family in September, and she was great to have while my husband was living out of town for 6 weeks for a rotation.